I think this shot shows a VW Prototype in its natural environment. Plus the guy looks pretty cool in his coat and hat. 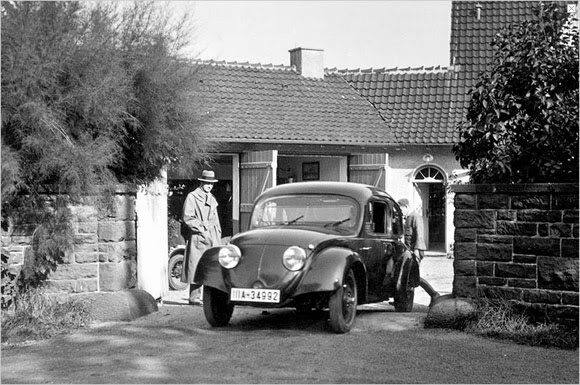 Hitler pulled out all the stops to get a car for the people built and Ferdinand Porsche did not disappoint getting three prototypes ready by 1936. The war put a bit of a damper on production but variations of the Beetle were used during the war. I even had models of them. Loved the amphibious ones. Drove VW's for thirty years, loved every one of them - got over 300,000 miles out of one of them! Wish I had it back today! Times have changed for the worse for the younger generations - no cheap transport available! Good point. I have noticed a few younger people driving 'old school' cars in my area. They are retro cool now but must make it so much cheaper for their parents to run, fix and insure.